CytoDetox gently supports the body's natural ability to detoxify. The drops contain ingredients provided by nature, with no known allergens. How is CytoDetox different from other zeolite detox products? 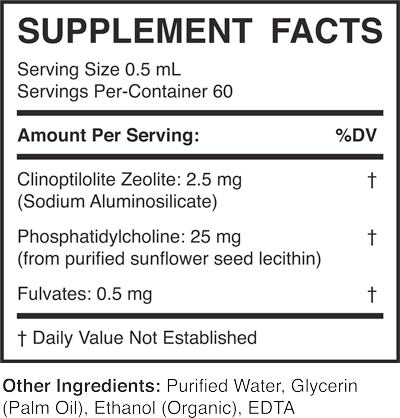 CytoDetox is unlike any other zeolite product due to the molecular weight of the fragments. The range of CytoDetox® particles are between 200-2000 daltons. CytoDetox also contains larger purified clinoptlite fragments to further support detox with size ranges that can be available in other body systems. How do I know CytoDetox is a clean product? An internal elemental analysis of CytoDetox shows it to be extremely clean, containing zero lead and no free aluminum. It’s a breakthrough in zeolite products. Can CytoDetox be taken with medication? Always consult with your health practitioner while taking CytoDetox. Can I take CytoDetox while pregnant or nursing? If you are taking medications, pregnant or under the age of 18 please consult with your health practitioner before taking CytoDetox. Are there any adverse effects I can expect while taking CytoDetox? If symptoms occur, cease taking CytoDetox and contact your health practitioner immediately. Also, please contact us by calling (702) 960-4540 to report your symptoms to CytoDetox. Always drink plenty of water while taking CytoDetox. The standard dosage is 0.5 ml to 1 ml, two to three times per day. Some divide the dose and start with 0.5 ml in the morning and 0.5 ml drops at bedtime on an empty stomach. Delay eating or drink at least 10 minutes before and after taking the drops. Each bottle is 1oz (30ml) and contains approximately 60 servings of CytoDetox. What are the ingredients in CytoDetox? Yes. International shipping fees apply. Is CytoDetox sold in stores? CytoDetox is not sold in retail stores. CytoDetox is sold through practitioners only. Please send all further inquiries to info@cytodetox.com or call (702) 960-4540.